In the last several posts in this series, we’ve looked at cyclical patterns of behavior of numbers and operators. For example, in the previous post we saw that when counting up, the last digit of a number consistently repeats after ten counts. We also saw that the last digit of a sum only depends on the last digit of the (positive whole) numbers we are adding. 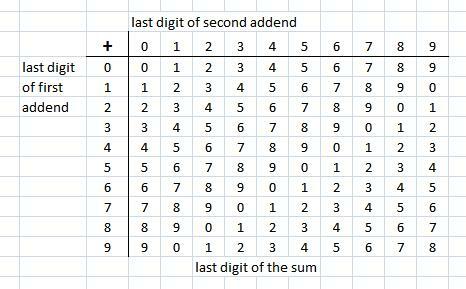 This is shown in the table above, and it is easy to check this on particular numbers, e.g. 28+2076. The table predicts that the last digit of 28+2076 is the same as that of 8+6, which the table shows us as 4. Since 28+2076=2104, its last digit indeed matches the 4 from the table. If we wrap a number line around a cylinder, kind of like a slinky, as we did in previous posts, we can get cyclical behavior that is not necessarily based on cycles of ten. Cycles of ten just happen to be very easy to spot from looking at the digits of the number, as our standard way of writing numbers is based on cycles of ten. To see cycles other than cycles of ten, we need to stop focusing on the last digit of the number, and instead focus on the remainder after division. This actually works for cycles of ten also, so let’s look at that first. What is the remainder of 7653 after division by 10? Well, 7650 is the multiple of 10 that comes closest to 7653 (yet stays below it), and so there are 3 left. 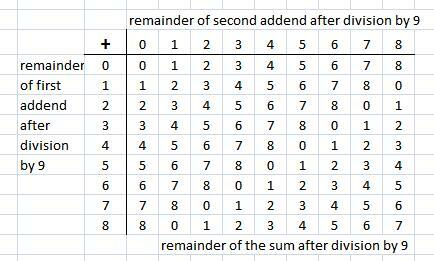 The remainder after division by 10 of a whole positive number is simple its last digit. This result is the basis of the well-known procedure of “casting out nines” by which people used to check their arithmetic before the widespread availability of electronic calculators. The “casting out nines” process was considered convenient in part because the remainder after division by 9 is relatively easy to determine. 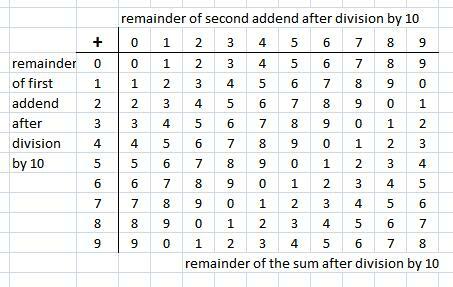 Though not as easy as finding the remainder after division by 10, you can get the remainder after division by 9 without doing long division, or any division for that matter. Instead, it is sufficient to add up all the digits of the number. For the number 7653, adding up all the digits gets us 21. The claim (not further pursued here) is that the remainder of 7653 after dividing by 9 is the same as the remainder of 21 after dividing by 9. We can do this trick – adding all the digits – repeatedly until we arrive at a single digit. For 7653, this takes two steps: 7653 → 21 → 3. And indeed, 7650 is a multiple of 9 (9×850), so we would agree that the remainder for 7653 is 3. The standard pronunciation of this notation would be: “7653 is equivalent to 21 modul0 9″. a ≡ b (mod m) if a−b is a multiple of m.
is considered valid, as -14 and 6 are 20 apart, an exact multiple of 10. Many people think of the modulo notation as having less to do with division than simply with repeated subtraction or addition. You can get from -14 to 6 by repeated addition of 10, and you can get from 7653 to 21 by repeated subtraction of 9. This entry was posted in Uncategorized and tagged black box, equivalence, models, representations, reverse engineering, whole vs. parts. Bookmark the permalink.